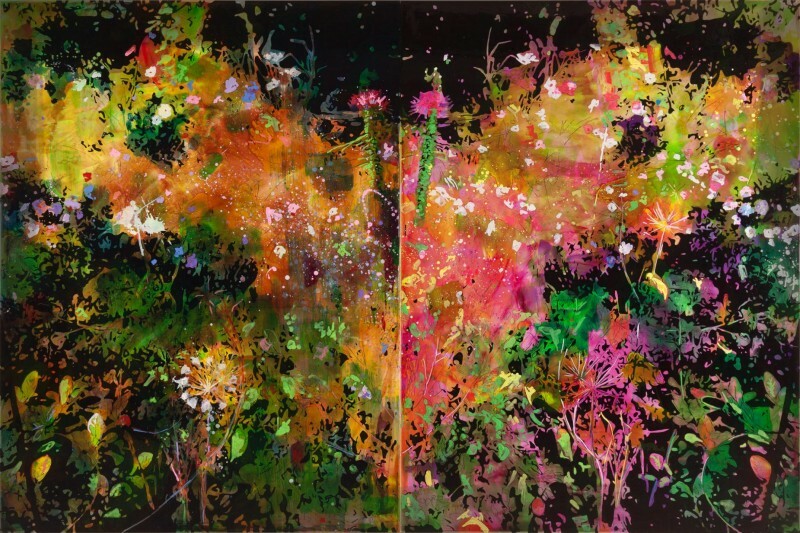 ANGELL GALLERY is very proud to present STEVE DRISCOLL: JUST A SLIVER OF THE ROOM. 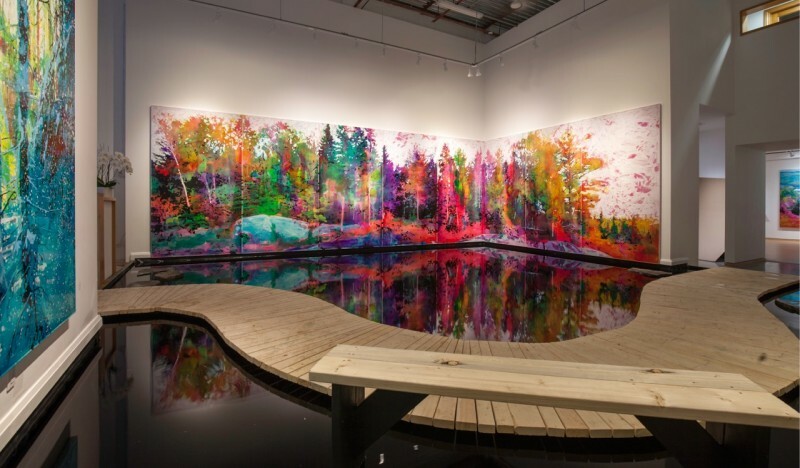 The show’s centerpiece is a new, epically scaled contemporary landscape painting presented in a specially designed installation featuring an actual lake and boardwalk running through the gallery space. The exhibition is on throughout the gallery from April 29 to May 28, 2016. 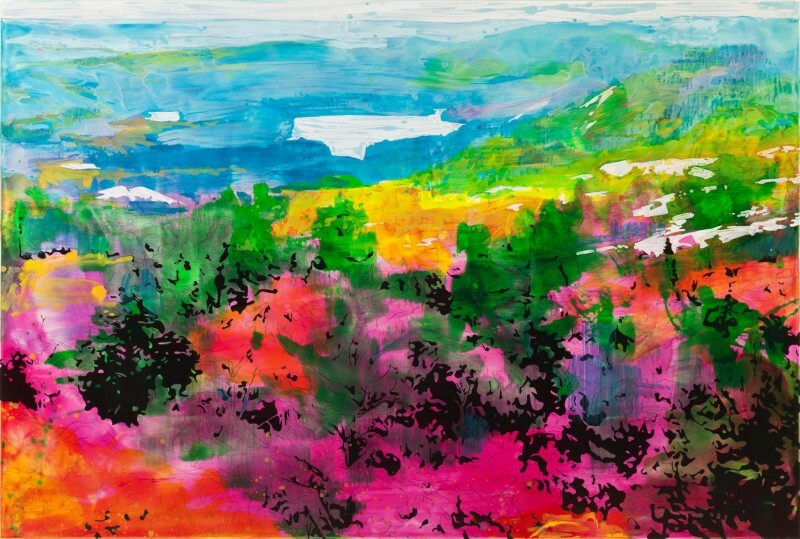 An opening reception will be held on Friday, April 29, 7:00 to 9:00 PM. 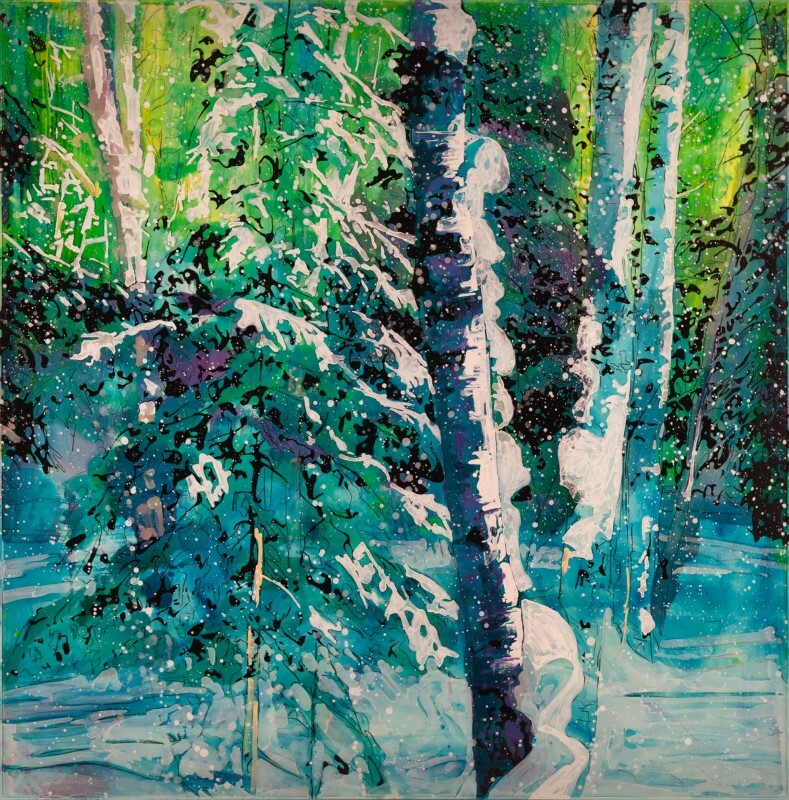 Just a Sliver of the Room marks a new phase for Steve Driscoll, the esteemed Toronto-based painter whose landscape paintings inject fresh energy into this traditional Canadian genre. For this exhibition Driscoll has created Recovered Shore, an eight-panel shoreline scene, ablaze with the colours of late summer. 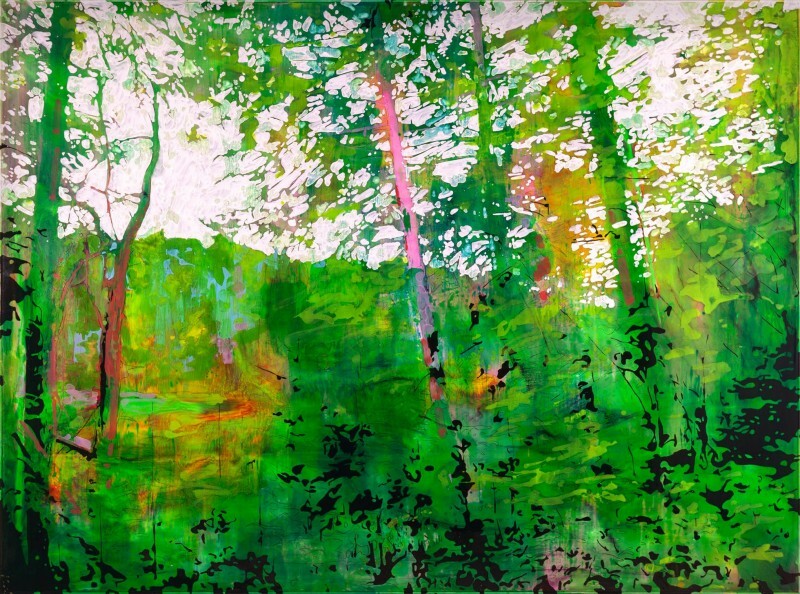 At forty feet in length, it is comparable in scale to Monet’s Water Lilies, and is Driscoll’s largest work to date. 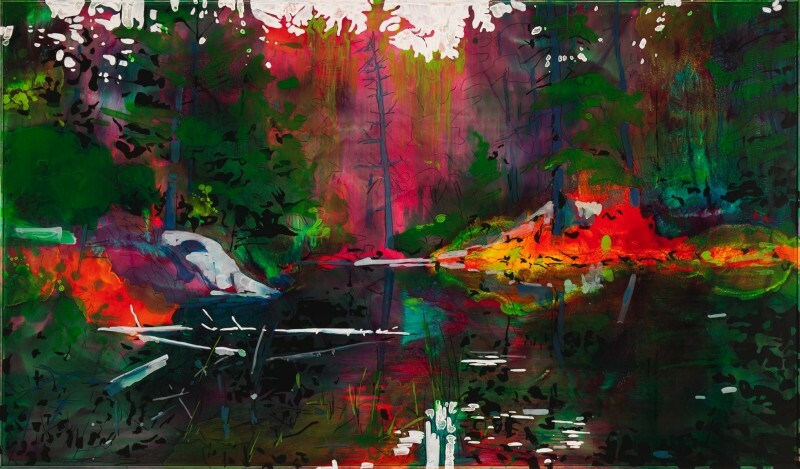 Recovered Shore, inspired by one of Driscoll’s camping trips in Algonquin Park, is painted in the artist’s signature technique of pigmented urethane. 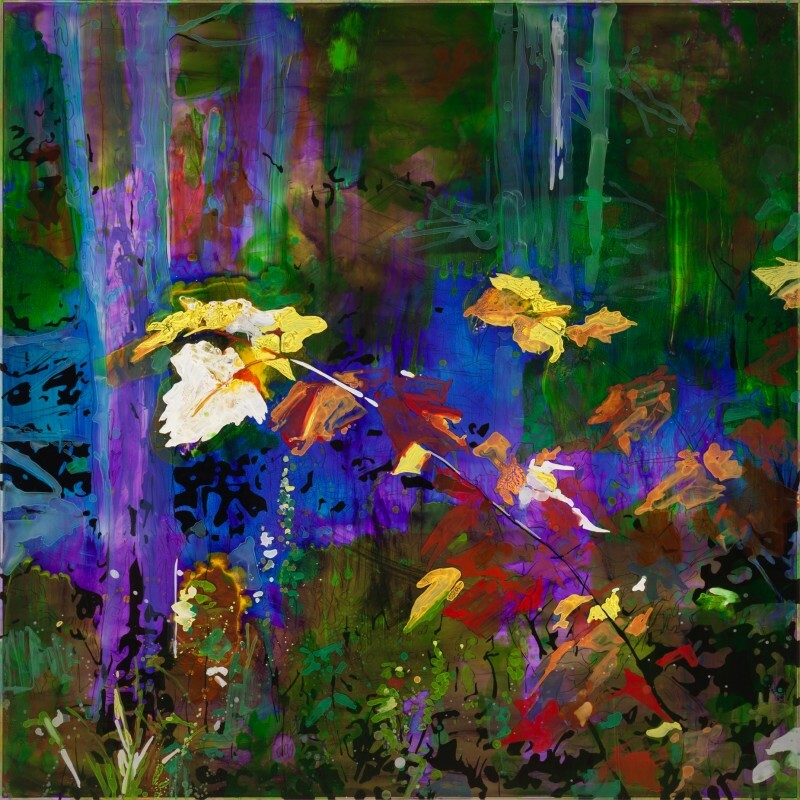 This unlikely and challenging medium, in Driscoll’s expert hands, is coaxed into a dazzling range of effects, emulating the black of the forest’s inner recesses, the pearly translucence of shimmering spray and the golden radiance of sunlit leaves. 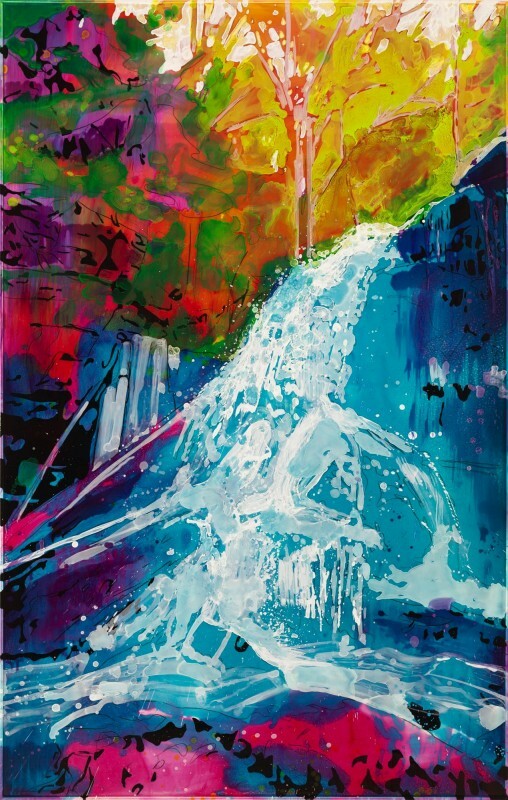 Passages of candy-coloured hues beyond the palette of nature have an intoxicating quality, and serve to underscore the painted image as an intensified memory, one “recovered” (as the work’s title implies) from the mind’s visual storehouse, and amplified by time. 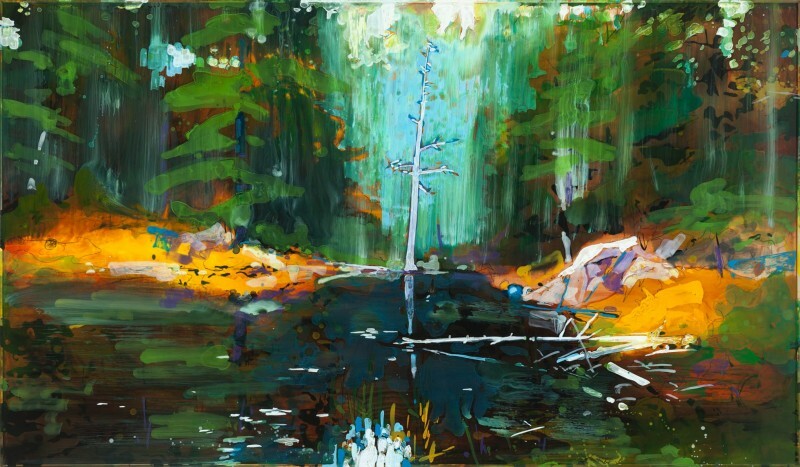 Driscoll’s paintings often include reflections in water, which add a layer of mirrored distortion that extends the depicted landscape into uncanny realms. But a recent visit to the magnificent Allerton Garden on Kauai Island in Hawaii, famous for its water features, inspired Driscoll to take a new approach, by incorporating actual reflections into the viewing experience. 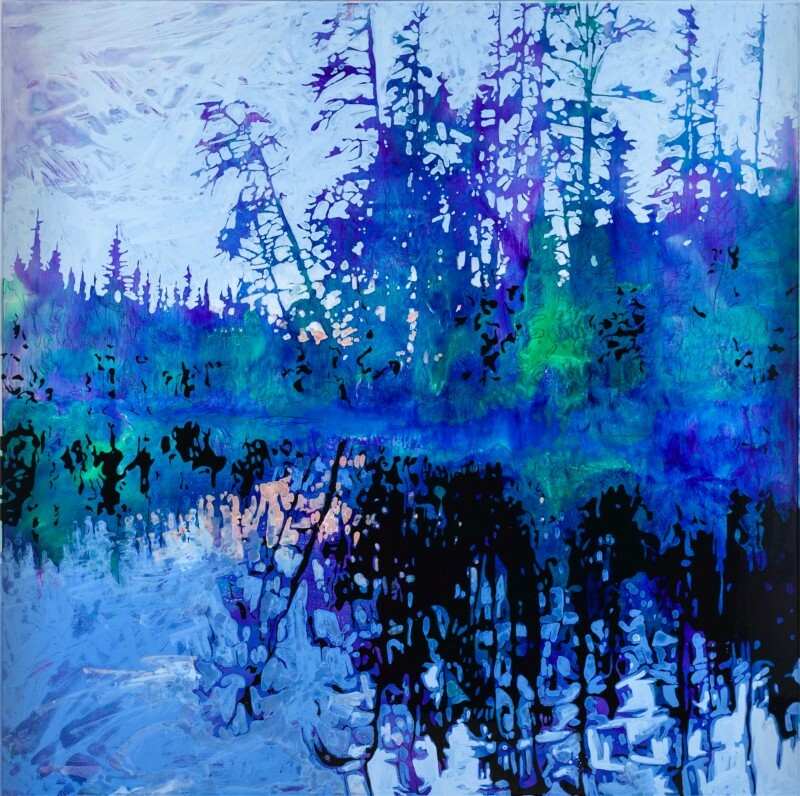 For Just a Sliver of the Room, the reflections of the landscape are captured in an artificial lake installed in the gallery. Viewers will take in the breathtaking shoreline vista from a meandering wooden boardwalk, reminiscent of viewing platforms in provincial parks, or evenings relaxing on the deck in cottage country. As people walk along the boardwalk, which is positioned over the lake, the vibrations from their footsteps set in motion ripples that activate the reflections, further animating the space. Other paintings in the exhibition depict winter and spring landscapes, completing the seasonal theme. 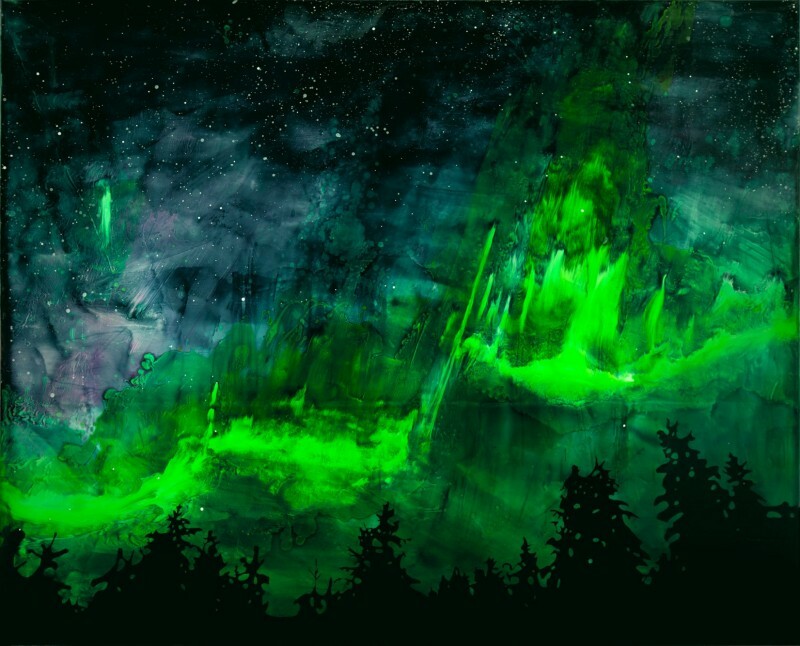 Steve Driscoll is an award-winning Toronto-based painter who has had twenty-five solo exhibitions and has participated in numerous group shows throughout North America. 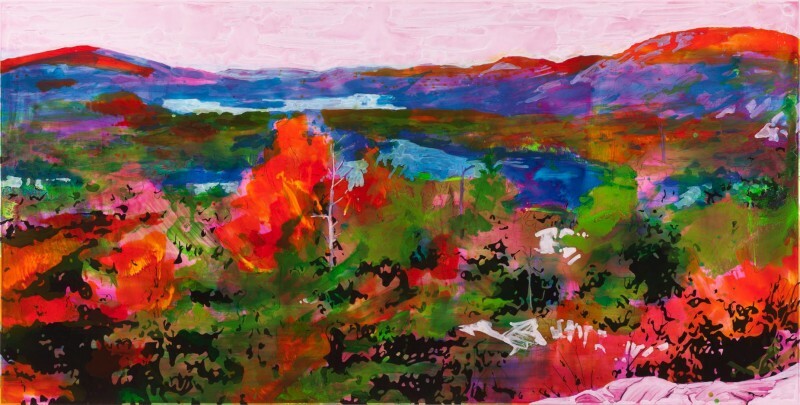 In 2019, he will have an exhibition at Tom Thompson Gallery, Owen Sound. 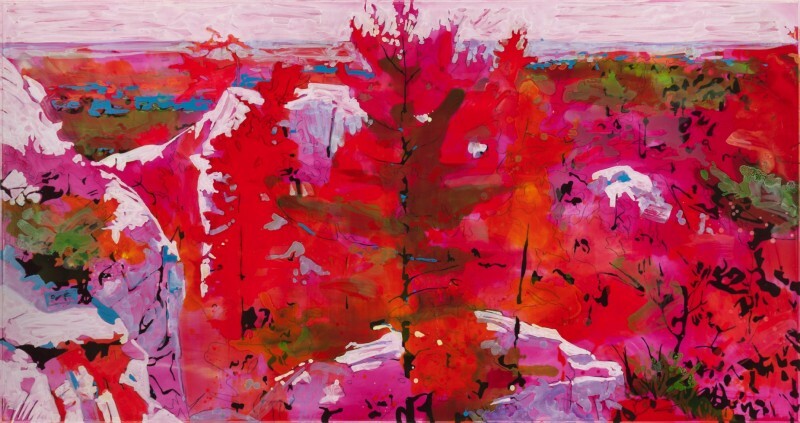 Driscoll has executed many commissions, is keenly sought after by collectors, and has been featured in Canadian Art, dART International, The Telegram (NL), NOW Magazine, CBC TV and ArtSync TV. Publications include the 2012 monograph intelligence with the earth, with text by Gary Michael Dault, and 2014’s Giving Context.